Some may find it hard to believe that Vauxhall can successfully target more prestigious cars like the Audi A5 with the Cascada, but this is a very decent car. It’s a comfortable and spacious open-top cruiser, if not the sharpest thing to drive – certainly worth a look if you’re in the market for a convertible. Interested in buying a Vauxhall Cascada? Vauxhall talks about the Cascada as a rival for the likes of the Audi A5, and while it isn’t quite as striking as the Audi, it’s certainly a smart-looking thing. The basic shape is simple, but elegant, and livened up by plenty of chrome detailing on the body. Like the Insignia, the Cascada has a ‘blade’ low on the side of the body, but on this car it’s mirrored by a crease that runs along the side and rises to finish in the rear light. The roof – which can be specified in three colours – sits fully inside the car when it’s lowered, leaving a sleek silhouette. The basic design of the Cascada’s interior isn’t too dissimilar from what you’ll find in an Insignia. However, thanks to the soft-touch materials, pronounced stitching and elegant dashboard moulding, the Cascada has a surprising amount of style. Every model also has a leather-trimmed steering wheel and sports seats, but as impressive as this all is, it’s no match for an Audi or BMW. If you’re the kind of person who expects any convertible to be a sports car, you’ll be disappointed by the Cascada. Rather than sharp handling, its focus is on a smooth, comfortable ride – and very effective it is, too. The result is a car that doesn’t respond well to being hurled through the bends, but if you treat it as a civilised and refined Grand Tourer, then you’re playing it to its strengths. Initially at least, the Cascada comes with a choice of three engines – two petrol, one diesel – and in keeping with the car’s character, they all give reasonable, if not especially sporty, performance. The basic 1.4-litre turbocharged petrol engine needs working quite hard to cope with a car as big as the Casacada’s; and, while the extra low-down torque of the 2.0-litre diesel is welcome, the long, widely spaced gears mean it’s easy to drop out of the engine’s sweet spot, demanding a gearchange. 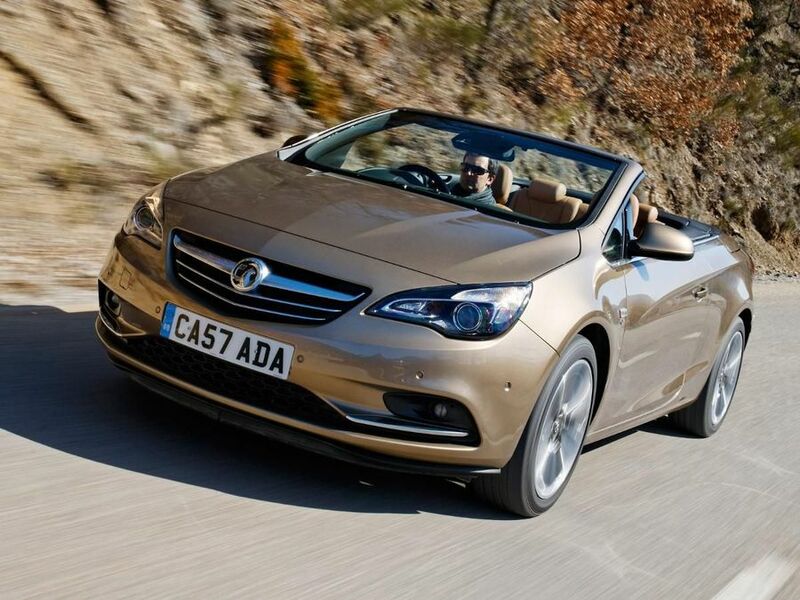 There are strong arguments to persuade you that the Cascada is good value for money. On the one hand, it’s bigger than similarly priced cabriolets like the Volkswagen Golf; and, on the other, it’s cheaper than similarly sized prestige cabriolets like the Audi A5. However, you don’t have to spend much on options for a top-spec Cascada to cost as much as something with a more desirable badge. Insurance costs on the Cascada are pretty much the same as on a comparable VW Eos or Golf, but the Vauxhall isn’t quite as good for economy: most like-for-like rivals give better economy and lower CO2 emissions. Vauxhall may not have the best record when it comes to reliability, but it’s mid-table in Warranty Direct’s rankings. And, on the positive side, much of the Cascada’s running gear is already proven in other models. The Cascada hasn’t been crash-tested, but both SE and Elite models come with plenty of safety equipment as standard. There are twin front and side airbags, as well as ESP, with Cornering Brake Control, traction control, and an active rollover protection system. The only difference between the trim levels is that Elite gets electronic front seatbelt presenters, and the only option (on both trims) is a tyre pressure monitoring system. Vauxhall bills this as a prestige car and it comes with plenty of standard equipment. The ‘basic’ SE comes with alloy wheels, air-con, a digital radio and Bluetooth connectivity. On top of that, you also get cruise control, sports seats, all-round electric windows and split/folding rear seats. Go for the Elite model and you upgrade to dual-zone climate control, leather upholstery, automatic lights and wipers, heated front seats and a windbreak. Among the options is a triple-layered ‘acoustic’ hood, which is a very worthwhile investment. The Cascada is a lot of car for the money and makes a very decent, comfortable way to soak up the rays. It may not quite have the premium feel of some of the more prestigious models it targets, but it does come at a lower price.